Sic-Bo is becoming a more and more attractive game for me recently, particularly that I am able to use all even money bet strategies including Perry B's methods outlined in his ebook 14 Months at the Sic-Bo Table announced at last week's newsletter. The nice thing about Perry B's methods is that you can use them for all even money bets in Roulette, Craps and Baccarat. Perry calls the Small and Big Sic-Bo bets, High and Low and calls the triples (1,1,1 - 6,6,6) "O"'s. So you can apply them directly to Roulette's High and Low even money bets, the "O"'s corresponding to the zeros on the roulette wheel. Moreover, the odds are identical: 2.8% in Sic-Bo versus 2.7% in single zero Roulette. I highly recommend Perry's ebook. You should take advantage of this very low price of $70, which is in place only for a limited time. You won't regret it. Perry's methods are low risk, have no progressions, and use a very special bet selection, giving the player a 51% winning rate played with flat bets only. Here is a testimonial received by a happy purchaser: Oen, whose post was published at the newsletter titled: Baccarat - Bet Selection Design. "I play only EVEN MONEY BET. Here is my idea to share with you all playing even money game such as Baccarat, Sic Bo and Roulette. There are principally two ways how you will play even money bets: you will play every roll, spin or hand or you will NOT play every roll, spin or hand; it means that you will play only when a certain event occurred. You can use entry and exit rules to filter your bet selection and therefore you do not necessarily need to play every bet. The advantage to bet when a particular event occurred is that you can use relative small betting unit but with a large amount and your betting progression will be kept in relatively flat or mild bet. So it is a kind of method that is low risk and can last longer. The following drawing shows you the relationship between a bet selection and a progression. 1. Exit rule: Play until 3 losses in a row occurred. 2. Entry rule: Enter when first bet won. 1. Bet unit=0 from the exit up to the entry point (fictive bet). 1. Exit rule: Lost or won, re-qualifying. Various concepts, which are based on the above idea, have been discussed on VIP forum, which are posted by Vegaskid. Many of his concepts can be applied for the above consideration. I want to share with you what I have done with Perry�s method. His methods are based on the above idea as well. I have used one of his methods and played on the Sic Bo table yesterday. I won 2 units with the unit = 50$. I played almost 20 rolls out of total 60 rolls. The highest drawdown was 3 units and the highest profit won is 4 units. So I stopped playing Sic Bo and switched to play Baccarat for the rest of the night. I will try to use his method on Baccarat. Maybe Perry can post some his experiences, too. My experiences have shown that even using my primary bet selection, not only should your daily stop-loss limit be very small, but you must often be content to accept only a small profit for the day, rather than being greedy, and end up giving back too many previous hard-fought wins. My own experience has been very pleasant with Perry's methods. I spent quite a few hours last Saturday at the Sic-Bo table. Using Perry's strategy I made 4 units within half an hour. Another feature I like about Sic-Bo is the speed of the game. After bets are placed within 10-15 seconds, the dealer calls no more bets and presses the button, which shakes the dice in a glass box. The dice are shaken for about 8 seconds until the results are displayed. Since not more than 5-6 people play the game, payouts are quickly and easily distributed guided by the lights of the winning combinations on the layout. So one roll takes about 30 seconds. Therefore, the game becomes two-three times faster than Roulette with the same odds and a lower minimum bet, which justifies Perry's choice of the game over others for even money bets. 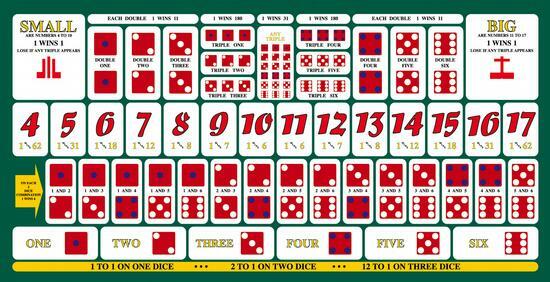 Betting on dice combinations 9,10,11 and 12 have a 6 to 1 payout in Sic-Bo. I quickly developed a strategy betting on all those 4 numbers, which made the payout 3:2. 9,10,11 or 12 show up quite often in the 3 dice combination. You can easily catch a good winning streak on those numbers. Betting on all 4 gives you 6 chips on the winning combination and 2 unit profit to your 4 unit investment. Getting 2 units on every win and losing 4 units on every loss, makes it similar to betting on 2 dozens simultaneously in Roulette, where you can use the betting methods for 2 dozens such as Relaxed Roulette or FRS, the contest winning system or any other good strategy you may have for 3:2 payout bets. I have also tried a d'Alembert type of bet covering the 4 areas 9, 10, 11, 12 by raising each bet by 1 unit on a loss and reducing by 1 unit on a win, until you are ahead by 1 unit profit. As Oen pointed out, Perry's even money bet strategies work quite well for Baccarat as well. With minimum amount of tracking one would be able to place a bet every 3-4 hands and reach the win target quite fast. I have tried them on Craps' Pass Line and Don't Pass Line with equal success. I fully endorse Perry's ebook. It's an excellent buy for $70. It will improve your overall gaming and gambling concepts, as well provide you with unique even money bet methods, not seen anywhere else. Your satisfaction is guaranteed.